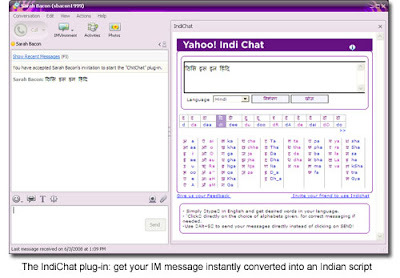 IndiChat plugin allows you yo talk to your friends in 9 Indian languages such as Hindi, Marathi, Gujarati, Punjabi, Bengali, Telugu, Tamil, Kannada and Malayalam. this plug-in and you can type in English and have your message translated into one of 9 Indian scripts. As you type, the English characters are displayed in Indian script and when you press the ‘Send’ button, it sends the message to your friend in the selected language.